1. Fold the front border rectangle in half both vertically and horizontally and finger press to find the center and make lines for hooping. 2. Hoop the cutaway stabilizer and center the rectangle in the hoop using the lapel temporary adhesive to secure the fabric. 4. Remove from hoop and cut away excess stabilizer. 1. 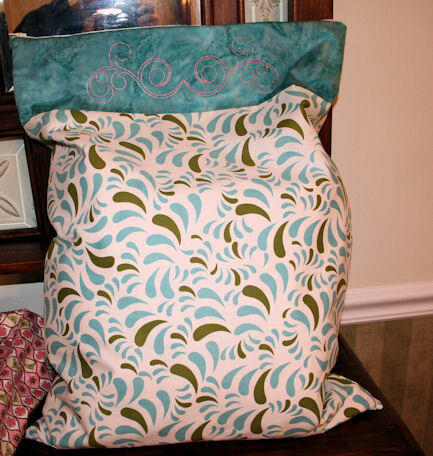 Place the front fabric face up on a flat surface. 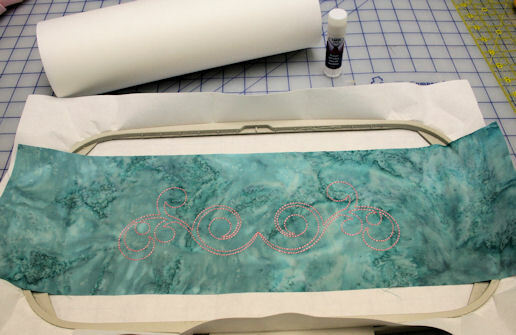 Put the embroidered rectangle face down and top facing downward on top. Align the top raw edges. Pin and sew. 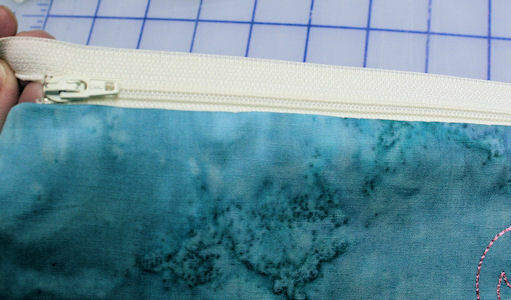 Press seams toward darker material. Repeat for back outside fabrics. 2. Again, place the front outside rectangle face up on a flat surface. Align the zipper face down along the top edge. 3. 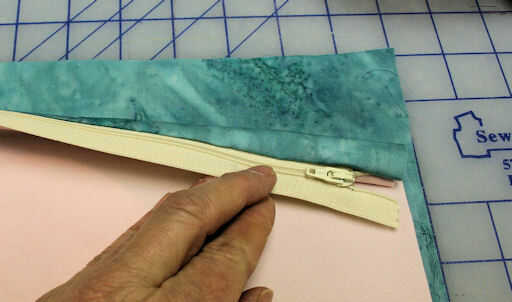 Place a PUL lining rectangle face down over the zipper and align the edge. Pin in place. Using a zipper foot sew along the edge. 4. 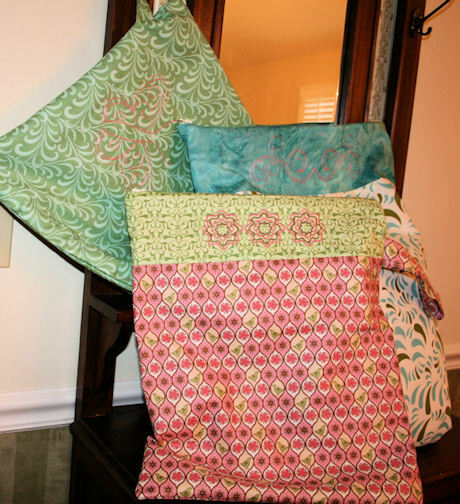 Flip the fabrics so the wrong sides are together. 5. Place the back outside rectangle face up. Align the second zipper edge face down along the top edge. 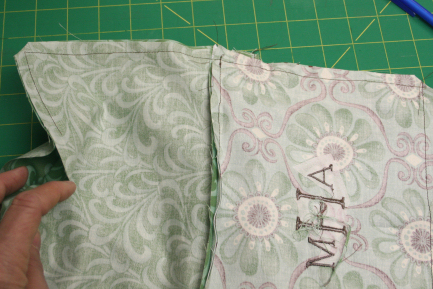 Place the lining rectangle face down over the top of all and align the edge. Pin in place. 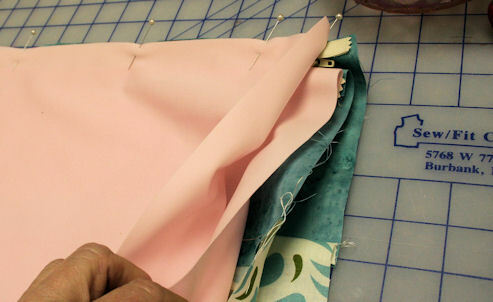 Using a zipper foot sew along the edge. Note: Some of the pictures would not download from the camera. So the images for the next steps were taken from this blog. They are the same other than the project size is much smaller. 6. Unzip the zipper half way. DO NOT skip this step or you will not be able to turn the finished wet bag right side out later. 8. 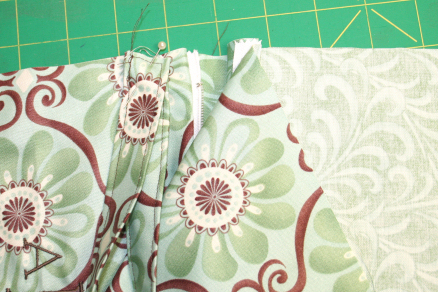 Sew all the way around the large rectangle leaving a 6" opening in the lining for turning. 9. Trim the corners. Turn right side out, unzip the zipper. 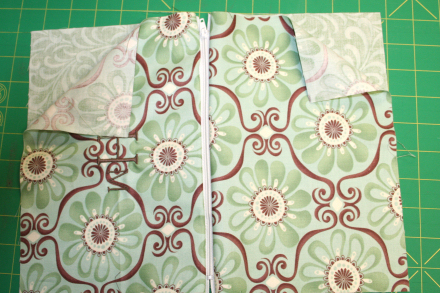 Then push the corners out on both the outside and lining. Stitch the opening closed. 10. Push the lining down into the bag. Zip it up Press edges if desired and it is ready to fill up with wet stuff. 1. With right sides together fold the strip in half longwise and press. Sew along long raw edge leaving both ends open. Turn right side out and press. Top stitch along both long edges. Set aside until you get to step 7 above. 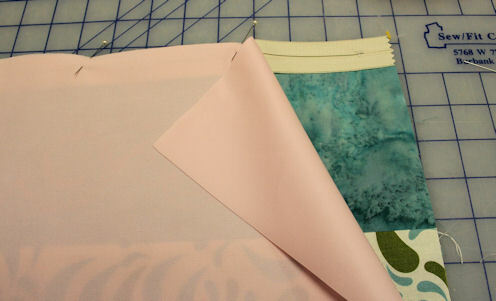 Two rectangles of cotton fabric 15 1/2" X 16 1/2"
In addition to holding diapers and other baby dirties wet bags are also great for wet swimsuits after a long day of lounging at the pool and sweaty towels/clothes after a good workout or hot game of tennis. They are also great to keep under the sink for those wet items that need to go down to the laundry. When the girls come to stay we will make a couple more just the right size for their swimming attire. They can pick their own designs and the oldest can even try doing the zipper I think. You can download the simple designs that I used here. The double swirl and the huge butterfly require a larger 6'X10" hoop. The three scallops design will fit in the 5"X7" hoop. 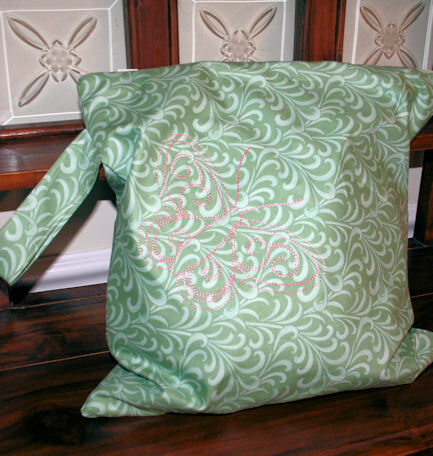 If you want to create pool style wet bags there are loads of design options on Annthegran. Lastly, here are a few other baby blogs from the past. Many have free designs you can download along with the project instructions. There always seems to be a baby to sew for somewhere close by. Hope you enjoy your embroidery as much as I do. 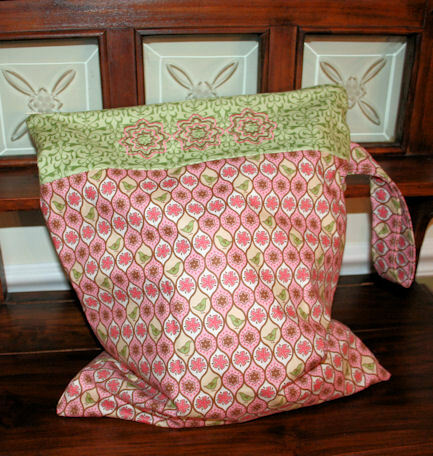 Those are super handy bags for new mamas. Thank you for the tutorial. I will be making one for the next baby shower.